He inherited the property and house on the west side of South Country Rd. near Beaver Dam Road on his father's death. The property became the Post country home known as "the Homestead.". Apparently, he also inherited other property holdings in Brookhaven Hamlet; and added to them during his residency. There had been a small Methodist cemetery on the west side of Beaverdam Rd., across from the High School. The cemetery property was contiguous to the Post property (and became part of his estate.). Many old headstones from that cemetery and from family graveyards, such as those from the Rose and Sweezey families, were relocated to Oakland cemetery. This lot was likely the property along Beaver Dam Creek that was to become the homestead for Elisabeth Post (his daughter) and Thomas Morrow after their marriage in 1920, and is now the headquarters for the Post-Morrow Foundation (See Brookhaven/South Haven Historic Site ID Br38.016-S). He was the second president of their Board of Trustees. On 31 December 1917, James H. and Louisa Post, along with Ford C. Ottman, of Stamford, CT, conveyed to the Stony Brook Assembly, Inc their site property. The Stony Brook Assembly was an evangelical organization that held a series of annual Bible Conferences and camp meetings at Stony Brook, NY on Long Island from 1909 to the early 1960s. Nationally and internationally known speakers led conferences covering religious, educational, and social topics. The conference center was founded by a series of predominantly Presbyterian ministers and laymen. The Assembly was also the parent organization which founded The Stony Brook School which use its grounds outside of the summer months. Though the Assembly eventually dissolved, the school still remains today. In addition to family, there were three female servants living in the household. They were living at 88 Remson St. In his household were his wife, Louisa W., daughter Jessie W., and three servants -- Anny Ellison, Laura A. Moen, and John Larson [John Larson (or Larsen) was the family chauffeur, see]. . In addition to being enumerated in Brookhaven in 1930, the family was also enumerated in Brooklyn. In Brooklyn, his household consisted of his wife Louisa W., daughter Jessie W., and two servants -- Annie Ellefson and Laura Moen. The chauffeur, John Larson, was not enumerated in Brooklyn. B. H. (Benjamin Huntting) Howell (see) was James Howell Post's first cousin once removed. B.H. Howell's son Henry Banks Howell (see) and James Howell Post were also partners in B.H. Howell Son & Co.
On 28 Dec 1901 he was first elected a trustee of the church, and six years later on 17 Jun 1908 he was appointed president of the board of trustees. He held this office until near his death in 1938. His home church was the South Third Street Presbyterian Church in Brooklyn. The house was to the west of the present location of the Old South Haven Presbyterian Church and the intersection of South Country Rd. and Beaverdam Rd. The Post property originally included the parcel on which the church now stands. The Carriage House now used as a church hall originally belonged to the Post's. 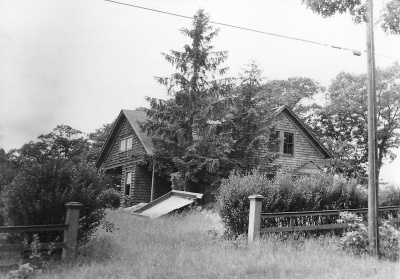 The house originally stood close to the road, and was later moved further back and much modified. It is labeled "C. Post" (Caleb, James' grandfather) on the 1873 Beers map and was probably built by him. The James Howell Post family also had a residence in Brooklyn, Kings, NY. James Howell Post, sugar refining financier, philanthropist, and civic leader, died yesterday in his home at 88 Remsen Street, Brooklyn, after a short illness. He was 78 years old. Surviving are his widow, the former Louisa H. Wells of Brooklyn; three daughters, Mrs. Philip A. Hubert, Mrs. Thomas I Morrow, and Mrs. Jessie W. Post, all of Brooklyn, and a sister, Mrs. Charles F. Cantine of New York. The funeral service will be private. Mr. Post, although small in stature, exerted the influence of a giant in those spheres of activities where he labored most effectively for more than a quarter of a century. From his office at 129 Front Street on the southern tip of Manhattan, he directed an industrial empire in sugar, reputed to be among the world's greatest. And in the the family home at 88 Remsen Street, Brooklyn Heights, Mr. Post controlled a flow of donations anonymously to Protestant, Catholic and Jewish charitable and educational institutions. A majority of those who knew him by sight will remember a quiet man, probably in the act if waving aside rounds of applause at a dedication or like ceremony. He attended to many affairs in the roll of officer but seldom delivered speeches. He disliked the limelight. Nevertheless, his generosity frequently placed him squarely before the public. Thus in 1930 the Downtown Brooklyn Association presented him with its first annual medal for distinguished service, and two years later the national Institute of Social Sciences followed suit with a gold medal in recognition of contributions to the "civic and cultural life of Greater New York." "Though long association with charitable work in New York, I have learned something of the individualized care which each family receives from private agencies. I am heartily in sympathy with the great governmental relief program, but I realize that in thousands of instances relief is not enough." "Nearest my heart is the rehabilitation of those so handicapped that they can never return to their former occupation. I believe, furthermore, the American public will give generously when they are convinced the need is real and the funds will be properly administered." Underlying the philanthropist's record was Mr. Post's personal story and vast financial gains from business enterprises. He began work at 15 as an office boy earning $3 a week. Born at New Rochelle, N.Y., on Oct. 13, 1859, the son of William and Eleanor Sackett Post, he traced his descent from New England settlers in 1650, Between the ages of 5 and 12 he lived with his family at Brookhaven, L.I. Years later he was to return to Brookhaven to establish a Summer home on Bellport Bay. In 1872 the Posts moved to Brooklyn. Mr. Post was educated in the Brooklyn public schools, at the International College of the Y.M.C.A. at Springfield, Mass. and at Colgate University, where he received his LL. D. degree. His first job was that of office boy with the firm of B. H. Howell Son & Co., Inc., of New York. The firm was the largest dealer in molasses and molasses sugars in the country with half a dozen factories in New York and Philadelphia. Changes in the tariff laws made it impossible to run the molasses factories. The result was the eventual organization in 1900 of the National Sugar Refining Company of New Jersey. Mr. Post became president of the concern. It had a capital of $10,000,00 preferred and $10,000,000 common stock. Anti-trust litigation instituted in 1911 prevented the American Sugar Refining Company form controlling the National through stock ownership. Again in 1924 rumors spread of an impending consolidation. The resultant firm would have been the largest on earth in that business with control over approximately one-third of the world's sugar refining facilities. Mr. Post was slated to become president of the amalgamated company at a salary of $75,000 a year. Attorney General Harlan E. Stone said he would oppose the move inasmuch as he conceived it his duty "to uphold decrees under the Sherman Law * * * rather than attempt to substitute my judgment for the wisdom of my predecessors and of the courts which entered such decrees." Mr. Post ended the consolidation talk with a statement in which he said the "unwillingness of the Department of Justice" would be accepted as final. During the World War he was chairman of the American Refiners committee of the National Food Administration. He issued repeated warnings of a sugar shortage unless housewives practiced greater economy. A so-called "sugar trust" action of major importance followed the organization in 1927 of the Sugar Institute, Inc., with Mr. Post as chairman of the board of directors and president. In February, 1932, the trial opened in the Federal court here, with the government charging the institute was a blind to hide an illegal price-fixing conspiracy in the restraint of trade. On the other hand, the sugar merchants said the organization swept away grave trade abuses. The case proved one of the most intricate ever tried under the Sherman Law and involved the most elaborate legal test of the activities of a trade association ever undertaken by the government. Points at issue included an unusually large number of those which must be considered by members of an industry seeking to cooperate for the elimination of abuses and general improvement of conditions within the industry. A large number of trade associations had modeled their codes of ethics upon that of the Sugar Institute. "We welcome the opportunity of having the courts determine finally the correctness of the course which we have followed in good faith." Besides the National Sugar Refining Company of New Jersey, Mr. Post was chairman of the board and director of the Cuban-American Sugar Company and president and director of the New Niquero and Guantanamo Sugar Companies. He was a director of the following: The National City Bank of New York, the Title Guarantee and Trust Company, the Atlantic Mutual Insurance Company, the United States Casualty Company, the Manhattan Fire and Marine Insurance Company, the Brooklyn Edison Company, the Brooklyn-Manhattan Transit Company, the Fajardo Sugar company, the Central Aguirre Associates, the Alliance Realty Company, the Holly Sugar corporation, the American Foreign Marine Insurance Association, the Underwood Elliott Fisher Company, the Westchester Insurance Company, the City Bank Farmers Trust Company, the Terminal Warehouse Company and the New Amsterdam Casualty Company, and a vice president and trustee of the Williamsburgh Savings Bank. He was chairman of the board of trustees of the Brooklyn Y.M. and Y.W.C.A. 's and gave large sums to both institutions; president of the board of trustees of Adelphi College, Garden City, L.I., and a trustee of Princeton Theological Seminary, Brooklyn Institute of Arts and Sciences, Brooklyn Bureau of Charities and a number of educational institutions in the United States, the Near East and Brazil. In 1925 he contributed $25,000 for the establishment of colleges in the Near East. Mr. Post was trustee of the Brooklyn Eye and Ear Hospital and of a number of welfare agencies in Kings county. In 1937 he received an honorable mention award from the Grand Street Boys Association for "his leadership and support of more than a score of philanthropic and civic organizations in Brooklyn." His clubs were the Union League, Engineers, City, the Down town, Hamilton and University of Brooklyn. He was president of the board of trustees of the South Third Street Presbyterian Church of Brooklyn. Governor Lehman, while on a visit to Brooklyn yesterday, said: "I have learned with very great regret of the passing of James H. Post. He was a man of kindliest spirit and of the broadest vision, whose sympathy and interest knew no limitations of race, color or creed. He was one of the most valuable citizens of New York. The community has lost a great leader and a friend." Mayor La Guardia deplored Mr. Post's death as "a great loss to the city and real personal loss to me. He was a kindly man and he had a real public interest." James H. Perkins, chairman of the board of directors of the National City Bank of New York and the City Bank Farmers Trust Company, said that "Mr. Post's death has brought deep sorrow to all his associates in the National City Bank of New York. He had been associated with the bank as a director since 1896. He had also been a director of the City Bank Farmers Trust Company since 1929." Justice Louis Goldstein, president of the Y.M and Y.W.H.A. 's of Williamsburg, Brooklyn, said: "I was greatly grieved to hear of the death of James H. Post, who had been for many years a friend of the young people of Williamsburg and was greatly interested in their problems." .. in the background is the Post family Brookhaven, NY home "The Homestead." .. Brookhaven Hamlet has had a long nautical heritage, both for commercial and pleasure boats. In 1912, James H. Post purchased this craft from a boat builder in Bay Share. It became a fixture in the Hamlet, first docked at Squassux Landing and later at a slip on Beaver Dam Creek at the rear of his daughter and son-in-law Elisabeth and Tom Morrow's home on Bay Road. The people in this picture are unidentified, although one of the women is likely Louisa, his wife. While the picture is said to have been taken by James Post, the man in the boat, while faint, bears a resemblance to Post. .. Br09B. Post Family home in Brookhaven. About 1905. .. a residence was provided by James H. Post to the family chauffeur, John Larson, while the family was living in Brookhaven. It was situated on Beaver Dam Rd. at the northwest end of the Post property. This document is the Brookhaven/South Haven Historic Site Data Sheet Br09B.2-S for the site, and includes a photo-gallery of pictures of the structure to modern times. Brookhaven Hamlet home of the Post family. This document is the Brookhaven/South Haven Historic Site Data Sheet Br09B for the site, and includes a photo-gallery of pictures of the structure to modern times. .. the Post Carriage House was originally a part of the James Post estate. It became the property of the Old South Haven Presbyterian Church (originally the Brookhaven-Southaven Parish) in 1959 when the congregation purchased the property from Elizabeth Post Morrow. This document is the Brookhaven/South Haven Historic Site Data Sheet Br09B.1-S for the site, and includes a photo-gallery of pictures of the structure to modern times. .. about 1929, in the garden of his estate at Brookhaven, NY. [S481] Richard Jones: James Post Descendants. "James H. Post, a sugar magnate, lived in Brookhaven, as did his father William Post, and his grandfather Caleb Post. Caleb Post built his house about 1823. He was first cousin to Nathan Post of Bellport (who begat Hiram, John and Nathan, 2nd). James Post lived in Brookhaven as a boy, attending the Brookhaven school and also Bellport Academy. At fourteen he went to Brooklyn to work for the Howell's in the sugar business, and Brooklyn became his home, summering in Brookhaven. His wife was the daughter of Rev. John Wells, who preached in both the South Haven and Bellport Presbyterian churches. The Posts retained the family's long-time interest in the South Haven Church, Mr. Post planted many of the maple trees on Beaver Dam Road and South Country Road and gave land for the library and cemetery. After his death his family gave fourteen acres to the hamlet at the foot of Beaver Dam Road, which is known as Squassux Landing. The west bank of Carmans River offers safe berthing to the largest aggregation of pleasure boats near Bellport Bay." [S163] Obituary: James Howell Post. [S604] Suffolk County News (Sayville), 28 Feb 1902, p. 4. [S127] Advance, Long Island, p. 3. 26 Oct 1906..
[S652] Suffolk County Deed Records, Liber 961, paqge 582; Deeded property to Stony Brook Assembly; 31 December 1917. [S1079] Stony Brook School web site, http://www.stonybrookschool.org/. [S107] 1920 Census (Heritage), Ancestry.com., Series: T625 Roll: 1143 Page: 155. [S129] 1930 Census, 1930 U.S. Federal Census > New York > Suffolk > Brookhaven > District 39. [S129] 1930 Census, Census Place: Brooklyn, Kings, New York; Roll: 1491; Page: 3A; Enumeration District: 912; Image: 352.0..
[S68] Personal Knowledge: Dorothy Hubert Jones. [S69] Sugar Plantations: Puerto Rico. [S159] Post Family, p. 287..